Waikīkī (“water spurting from many sources”) ahupuaʻa lies between Honolulu (from the west side of Makiki Valley) and Maunalua (the east side of Wailupe) – essentially from Piʻikoi Street to the ʻĀina Haina/Niu Valley boundary. Three main valleys Makiki, Mānoa, and Pālolo are mauka of Waikīkī and through them their respective streams (and springs in Mānoa (Punahou and Kānewai)) watered the marshland below. Pālolo valley, within the ahupuaʻa of Waikīkī, has ʻili for kalo (taro loʻi) and forest products that benefitted other portions of the ahupuaʻa (such as ʻĀina Haina, Wailupe, Niu and areas near the beach) – they are essentially ʻili lele (jumping ʻili) that provide these resource lands (wetland for kalo and mauka forest lands) to the other areas of the ahupuaʻa that do not have them. Fast forward a few centuries. Pālolo Valley was once home to a golf course, rock quarry, two dairies and, during World War II, an airfield. Pālolo Elementary School first opened its doors in September 1921 under the leadership of Principal William Kekepa. Its first buildings were converted military barracks and the school was next to a golf course. Opened in 1931, the nine-hole Pālolo course was first one open to the masses (the Islands’ first course, Moanalua Valley course, opened in 1898; Oʻahu Country Club opened in 1906, Waiʻalae in 1928.) Later, that golf course was turned into a public housing project that is now Pālolo Valley Homes. Additional shelters for evacuees were built in Pālolo; however, they were “held in readiness for evacuees in connection with (another) attack.” The Pālolo Valley Camp never accommodated Islanders displaced after the initial attack on December 7. A memorandum written in February 1942 confirmed that Pālolo remained unoccupied. The HHA also developed public housing. Members of a Congressional subcommittee, which came to investigate Honolulu’s housing situation (in Pālolo and elsewhere) in March 1945, learned of “hot bed apartments” where as many as eighteen men occupied one room in three shifts. With the conclusion of World War II, the Pālolo School Camp was closed as they were deemed unsatisfactory for occupancy. The Pālolo Evacuation Camp adjacent to the 362-unit emergency housing project in Pālolo remained in operation. Pālolo provided post-war housing opportunities; a three-bedroom home in 1950 cost about $11,500. In 1955, the Pālolo Golf Course was replaced by Jarrett Middle School and the Pālolo Valley District Park. More housing was also provided. Jarrett Middle School was established in 1955. The school was named in honor of William Paul Jarrett (1877-1929,) who was a delegate to the US Congress when Hawaiʻi was a Territory. Mr Jarrett gained national and international recognition for his efforts as a humanitarian. 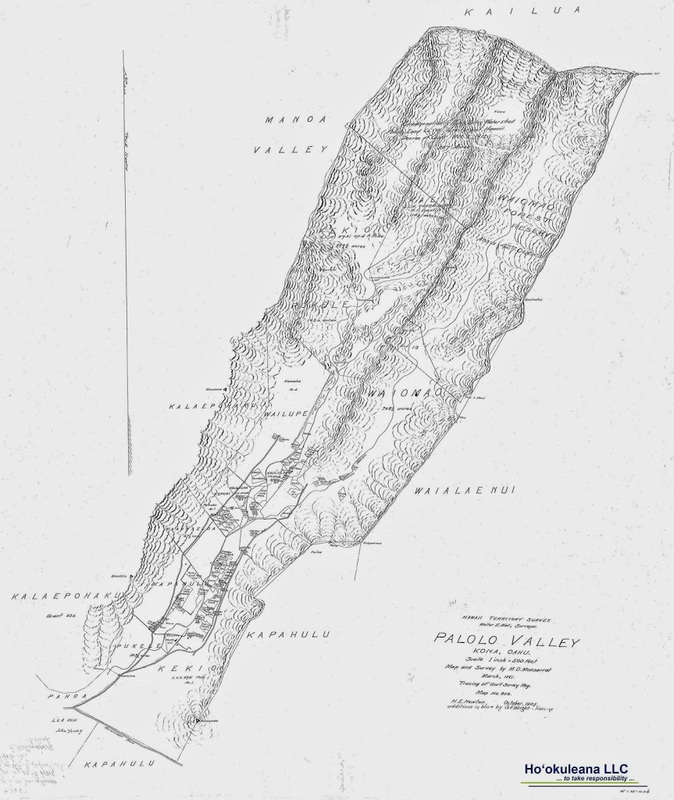 The image shows a map of Pālolo in 1881. In addition, I have added other related images in a folder of like name in the Photos section on my Facebook and Google+ pages. The present Waikīkī has a land area of approximately 500-acres; it once was a vast marshland whose boundaries encompassed more than 2,000-acres. Three main valleys Makiki, Mānoa, and Pālolo are mauka of Waikīkī and through them their respective streams (and springs in Mānoa (Punahou and Kānewai)) watered the marshland below. The early Hawaiian settlers, who arrived around 600 AD, gradually transformed the marsh into hundreds of taro fields, fish ponds and gardens. Waikīkī was once one of the most productive agricultural areas in old Hawai‘i. By the time of the arrival of Europeans in the Hawaiian Islands during the late eighteenth century, Waikīkī had long been a center of population and political power on O‘ahu. By 1892, Waikīkī had about 550-acres planted in rice, representing almost 12% of the total 4,700-acres planted in rice on O‘ahu. Nearly 85% of present Waikīkī (most of the land west of the present Lewers Street or mauka of Kalākaua) were in wetland agriculture or aquaculture. 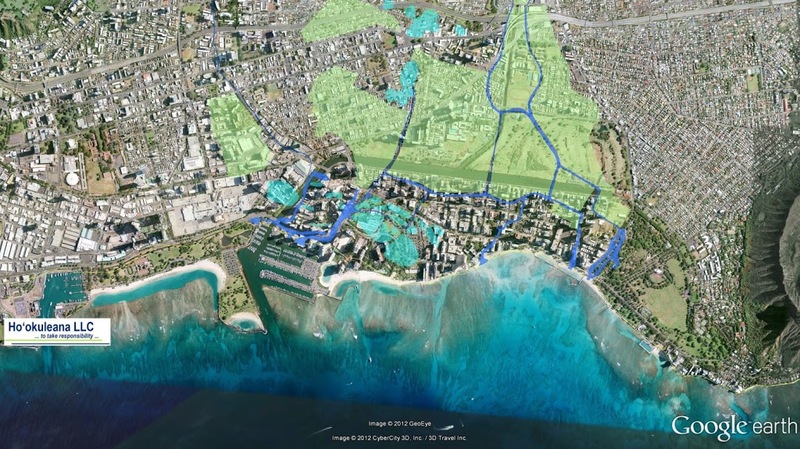 However, drainage problems started to develop in Waikīkī from the late nineteenth century because of urbanization, when roads were built and expanded in the area (thereby blocking runoff) and when a drainage system for land from Punchbowl to Makiki diverted surface water to Waikīkī. Soon after, in 1928, the construction of the Royal Hawaiian Hotel was completed (joining the Moana Hotel (1901,) marking the beginning of Waikīkī as a world-class tourist attraction.